May | 2014 | Pedal Dad! I’ve just realised that it was about a month between blog posts. That’s a long time and let me tell you why. Don’t get me wrong. I’ve loved life since the marathon (other than the ongoing will-it, won’t-it concern over one precarious looking toe nail). No, I’ve had a great time and felt like there was almost a new found freedom. But there was also a hole. A gap left by something that had been a huge part of my live, both emotionally and physically, for six months. I’ve not felt miserable but felt that something had gone. Like something was missing. And that is nuts considering that I’ve had brilliant evenings and weekends with my family. Enjoying their company and (sometimes) them enjoying mine too. I’ve had little enthusiasm for training up until a couple of weeks ago. The concept of crawling out of bed at 5.30 to go for a run is so far removed from my mind that it’s like I never did it before the marathon. Maybe it’s a bit of healing. Over the weeks since the marathon I have had unexplained knee pains (not starting until 5 days after the race) and pains in my shoulder (come and gone in the space of a week) and I’ve taken these as signs of my body still healing from that amazing effort it produced in April. It’s almost like grieving too. You know that feeling when you’re not sad all the time but just a little down from time to time when you least expect it? When sitting daydreaming is a better option that getting up and doing something? It’s not like me to behave like that and I think I’m through it, but it was a little strange. Call it post-marathon blues. Or to continue to use the Shed Seven theme and call it A Hole. I’m out of it now. I’ve got a new bike, rode to Skegness again at the weekend, the big cycling trip of the year is planned and I continue to be inspired by Mrs G’s efforts in training for her London to Brighton challenge. It’ll be summer soon. That should bring warmer bike rides, brighter evenings, some French cycling and hopefully Mont Ventoux before the RAID in September. If that little lot can’t get you out of a motivational hole, nothing can! It’s difficult isn’t it? As one relationship cools off another one inevitably begins. Everyone has experienced those sombre feelings when what you once had becomes something less to talk about and more something to endure. Then you start looking around and you wonder how and why other people have got the relationships that seem to be so much better than yours. Well, it’s happened to me too. For a while now, I’ve lusted elsewhere. Often, my head has been turned whilst out and about but this weekend it finally happened. Our partnership that was once so strong was finally severed. I didn’t intend it to happen but we were out with some friends and they were all talking about how happy they were with their (mostly new) partners and it galvanised me to act. Temptation is everywhere and as soon as I’d decided to do something about my nagging dissatisfaction, things were moving fast. Faster than I thought. We met on Saturday night for the first time and I knew pretty much instantly that I had found what I was looking for. My mind was doing overtime. I don’t think I’d ever seen a beauty so stunning. On Monday I made my move and unbelievably by Tuesday we were heading back to my place. We didn’t do much that first night. Just played a bit and got to know each other. Exploring everything for the first time was so exciting that I couldn’t settle down at the end of the night and sat dreaming about what the next day would bring. So yesterday on a warm, sunny evening I proudly introduced my new partner to some friends. They seemed quietly impressed and kept checking in to see how we were getting on together. I told them that everything seemed comfortable and was going smoothly, of course there were some differences to what I was used to but on the whole that first evening out with friends was exhilarating. It really feels like I am on to a good thing. So I have no regrets from moving on so quickly and decisively. We had some good times together and our trip to Paris will always be special to me, but times change. 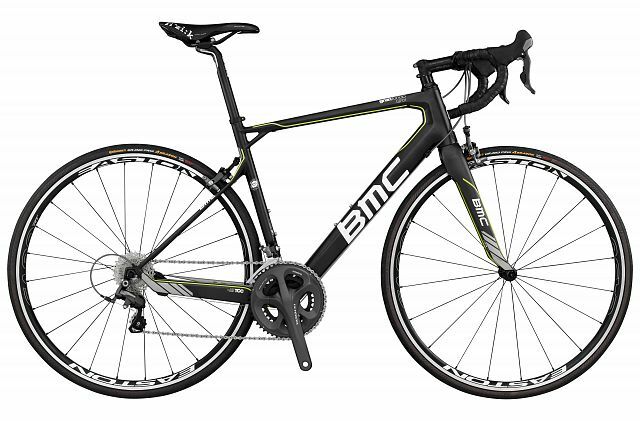 Let’s face it, I’d had my old bike for 4 years and it didn’t owe me anything so splashing out on a lovely BMC Granfondo GF01 with full Ultegra gears and a frame lighter than an XL Bacon Double Cheeseburger seems perfectly reasonable to me! So it’s au revoir to the Boardman and bonjour ma cherie to the BMC. Let the good times roll!! Keep your eyes off. She’s mine!